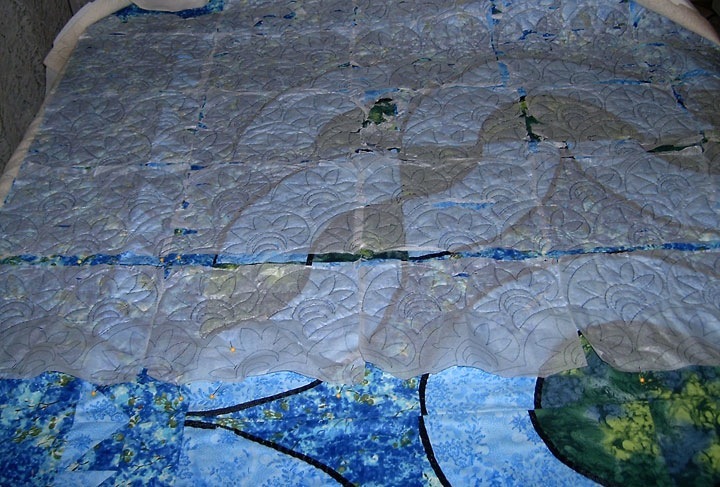 This is almost half way thru the quilting on case128. Essentially 1 row shy of it, and my goal for today. I give up. I’ve had enough for one day! Seriously! It’s been a battle of sorts all day .. not a HUGE battle, but more like a struggle / contest of wills ..and those can be just as tiring as battles and wars – specially when they are waged over a several hour period. I guess the first one was when I was piecing the batting – I sewed the long and short sides together wihtout realizing it until I had way more left than the other .. RIPIT RIPIT start again .. I wasn’t smart about where my pattern ends on the sheet .. so i’m creating a minor mess of sorts with the tissue there – I finally gave up trying to follow it and just winged it .. hey it’s freemotion after all. Since I’m using a cotton batt, this quilt is heavier ..so of course I’m having to apply more pressure with my hands (Thank God I use gloves!!) to move the quilt along .. and of course Newton’s Third Law of Motion “states that any time a force acts from one object to another, there is an equal force acting back on the original object. If you pull on a rope, therefore, the rope is pulling back on you as well. “ Meaning in this case – exerting more pressure causes the tissue paper to RIP. This is just one of the few battlefields where a contest of wills was waged. Good thing by this time I had gotten into a rhythm and it was easy enough to fill in the ‘holes’ so to speak. I didn’t really remember this issue when doing my kitty quilt tho – granted this quilt is bigger – ergo – heavier. As I stated already, my goal was half way – I think a realistic enough goal and easily doable! I think that someone, somewhere is trying to tell me something .. I really do! Just before I finish the 2nd to last row, maybe 4″ shy of it, the thread in my bobbin runs out .. Okay .. not a problem .. NUTS .. all my bobbins are empty now .. so I grab my bobbins and head into the cat cave to spin up a few more. Okay .. get back and start sewing again .. 2″ left in the FINAL line, and my spool runs dry .. 😐 Are you kidding me??? **sigh Okay .. get the other spool, thread the machine, lock my stitches and finish that row. Check the back and see the mess from the dry spool and NO tension – fix that .. By this time, I’ve been seeing mistakes get made and just kept on going .. SInce I”m rolling the quilt into the bed area, it’s getting harder and harder to move freely and there’s all sorts of bumps and jiggles as I get closer to the middle .. I was right here .. I had cut my thread at the bottom and was about to lock my stitches when I see the thread slip thru my fingers and swoop thru the hole in the needle .. 😐 THAT’S IT! I’m done! I’ve had enough .. So here I stopped .. and this will be waiting for me tomorrow – whenever I get back from being kidnapped and praying I won’t be to tired for this .. but I just can’t be .. this is my final countdown this weekend .. so this and a few other things have to be done. The nice thing is, it’s a new day and a fresh start! 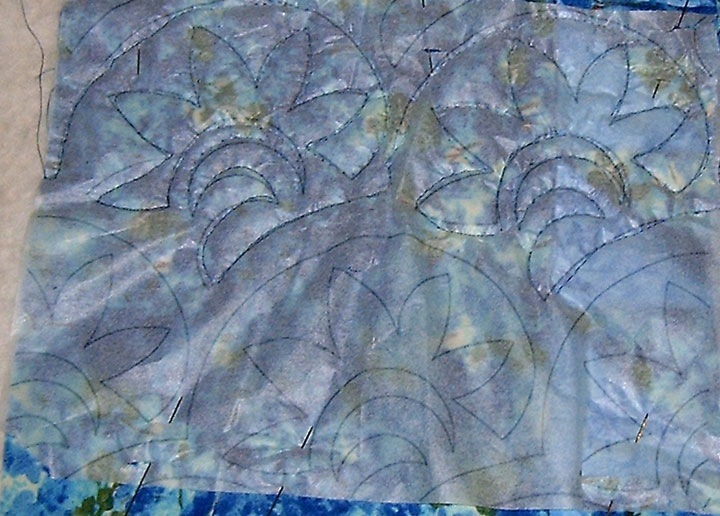 I’ll finish this last pass with no issues, flip the quilt and it’ll get easier and easier – Today I’m tired – I didn’t sleep good last nite (I actually had a few nitemares??!!) 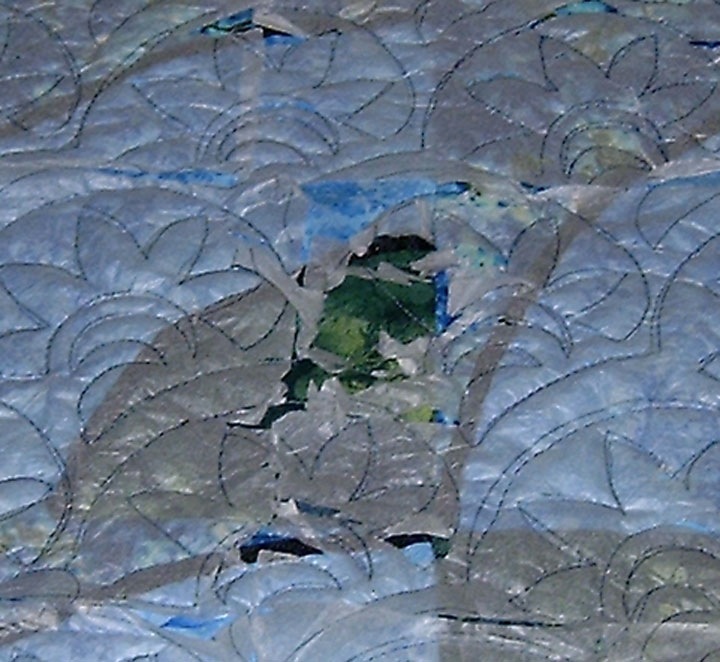 so my sleep was broken and doing this quilt is hard-er work … Not my normal zoom zoom ..
Aw, man! I hate it when that happens! You actually stuck it out longer than I would have – though that may just be a theoretical statement. I know how it is, by the time you cut your losses you realize that you shoulda done so ‘way back when!